The St. Patrick Legion of Mary praesidium has been closed since we had only two members. (A praesidium must have a minimum of four members to continue.) Auxiliary members will be affiliated with another praesidium in the Diocese of Birmingham. We offer our sincere gratitude for your support of our ministry. Each Praesidium of The Legion of Mary is named for one of the Blessed Mother's many titles. Our Praesidium here at Saint Patrick is Our Lady of Perpetual Help. We began meeting early in January, 1999 under the Spiritual Direction of Deacon Dan Whitaker. We meet in the Conference Room every Wednesday at 9:45 AM. The focus of our apostolate has been the visitation of the sick and homebound members of our Parish Family. When we visit Nursing Homes we seek out other Catholics there and minister to them as well. We are privileged to be able to offer them the opportunity to receive Holy Communion. We find tremendous joy and fulfillment in visiting those who spend so much of their time alone. We also have forty-two Auxiliary Members who offer the Rosary and Legion Prayers (contained in the Tessera) daily in prayerful support of our apostolate. The government of The Legion of Mary is based on the Roman Legion and many of the terms and titles of the Legion come directly from that ancient organization. 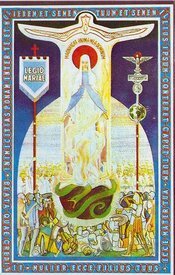 There are those who feel the rules of the Legion of Mary are too rigid or restrictive but we maintain that an organization which has flourished all over the world for eighty-four years must be doing something right! We follow the rules secure in the knowledge that Our Blessed Mother will intercede for us with her Son, our Savior. Active membership in the Legion of Mary requires a commitment, but experience has shown that the rewards outweigh the cost. For more information, please contact Donnie Schober via e-mail here.